An iconic image of Sherlock Holmes leads to the story of a relationship that lasted 35 years. Here's how it all got started. Fridolf Johnson's bookplate for Vincent Starrett, showing a friendly Sherlock Holmes, circa 1931. I can’t remember the first time I saw this image. It seems like it’s always been there, a part of the history that I associate with the early years of the Baker Street Irregulars in general and Vincent Starrett in particular. The copy posted here came from an old friend who has since passed on and is dearly missed. He knew of my interest in Starrett and one day I opened an envelope that had come in the mail to see the single sheet of heavy black paper and the face staring out at me that had been a beloved memory for so long. The fact that the bookplate also bore Starrett’s signature was almost too much to fully take in. The image creates a sense of nostalgia for a time that was gone before I was born, when Holmes could be shown as an amiable fellow in deerstalker, holding his pipe, his face showing a thin smile. There is none of the modern interpretations here, no sign of the cocaine fiend with mommy issues or the troubled genius with high functioning sociopathic tendencies. The Holmes shown in Starrett's bookplate is a kinder, gentler fellow, who would be welcome around your fire on a winter's night as he regaled you with stories of his adventures. It’s the kind of image that, to my mind, represents the Golden Age of the American Sherlockian movement. The fact that it is Starrett’s bookplate makes it all the sweeter. My sense that the image is — or at least for a long period was — ubiquitous in the Sherlockian world was born out while thumbing through W. E. Butler's little book, Sherlockian Bookplates, first published in 1992 by Silent Books, Cambridge. "This bookplate design by the late Fridolf Johnson is perhaps the most widely illustrated Sherlockian bookplate." I might be wrong here, but based on his comments elsewhere, I believe Butler meant to say that this is the "most widely known Sherlockian bookplate" in existence. As you will see later, the image has been used often outside of its original purpose. But it was not until recently that I noticed the name of the plate’s designer tucked his name along the bottom of the black background: Fridolf Johnson. The name set off a cacophony of bells and sent me to the shelves to slip down a few of the lesser known of Starrett’s works. The stiff boards cover of Starrett's 1927 pamphlet of poems. Edwin B. Hill published a booklet in 1927 with a title that exactly described the contents: Fifteen More Poems. Starrett’s bibliographer, Charles Honce, notes that this was published with “Various colored wrappers; 110 copies.” Starrett’s comment on the volume was “It took E.B.H. a year to do this on his hand press – since then I have given the poor fellow only leaflets.” In fact, the last page of the booklet says that Hill started work in March of 1926 and completed it in June of 1927. The copy under discussion has lost its original wrapper and was once roughly bound in hard boards that have since worked their way loose. It is one of the more delicate pieces in my collection, with its leaves threatening to scatter if the breeze through the window next to the desk is too strong. On the front free endpaper (which is truly coming free), is Starrett’s inscription to Fridolf Johnson. Back to the issue at hand: If the block and bookplates were made in 1931, they would have come just as Starrett was planning to use his personal Holmes collection as the basis for The Private Life of Sherlock Holmes. In fact, what would become the first chapter of Private Life was published in December 1930, while the book itself was published in 1933. So the bookplate comes during Starrett’s Sherlockian sweet spot. The title page to Banners in the Dawn. That Starrett and Johnson remained friendly for several years is evident from a second book inscribed by Starrett to Johnson. Banners in the Dawn was another compilation of Starrett’s poetry. The book of 64 sonnets was published in Chicago by Walter M. Hill in an edition of 250 copies. A note at the back of the book says it was issued in November 1922, although the title page carries a date of 1923. Honce notes the book was ”on sale by Christmas,” so the November date is likely a good one. The inscription Starrett did in Banners in the Dawn for Fridolf Johnson. I've lightened the image a bit so the inscription will be more readable. Fifteen years after the book was published, Starrett inscribed a copy of Banners in the Dawn for Johnson. This little book has a few other points of interest. The first is one of Johnson’s own bookplate on the inside cover. The illustration shows the Greek god Pan, recognizable from his tail and flutes. Johnson's bookplate is at the end of this essay. Someone has also tucked in a cutting of a Starrett verse that is not in the book. It’s clearly from a newspaper, but when and where it was published is not noted. The clipping can also be found at the end of Part 2 of this essay, which will be posted next week. To my mind, the most remarkable feature in this book is the annotations in Starrett’s hand for the sonnet "Salome." Fifteen years after its publication, Starrett was still rewriting it, toying with the language and meter. For the sake of comparison, I’ve included the poem from another edition of Banners, without Starrett’s notes. "Salome" would seem to have special significance to Johnson. Among the bookplates he created for himself is one depicting Salome’s dance. Lew Jaffe in his Confessions of a Bookplate Junkie blog has reproductions of Johnson’s bookplates, including this one. Librarians at the University of Delaware, where Johnson's papers are housed, confirmed he had a broad range of articles, photographs, and other items related to Salome. Reports librarian Curtis Small: "It looks like Johnson was clipping and collecting everything (in the way of articles and images) he came across that related in some way to the Salome legend. This includes items like a newspaper article about a liberal preacher in Saugerties, New York, who had a belly dancer perform Salome's dance in church, and a piece about a 16 year-old who was prohibited from dancing Salome in Detroit." Those clippings that are dated show his interest spanned several decades. Starrett's "Dicksons Close" bookplate. Although not signed, it was created by Fridolf Johnson for Starrett circa 1925. A copy of the bookplate is in a book I recently acquired and is included here. Why Starrett chose this image is not clear. Lacking other information, it's only speculation, but I suspect Starrett liked the image of two men leaning out their windows to discuss a book across the alley. The phrase "His Book and His Friend" certainly describes the relationship Starrett had with his books. For what it’s worth, Dickson’s Close was an alley off High Street in old Edinburgh. The original image comes from a tome called The Book of Old England. The book was published in Edinburgh (where else?) in 1886. The image that was the original can be found by clicking on this link. Thirty-five years after Fridolf Johnson created the Dickson's Close bookplate for Starrett, the two cooperated once again, and the subject was Sherlock Holmes. For Christmas 1960, Johnson produced a little booklet for Starrett's friends as a holiday gift, titled Monologue in Baker Street. 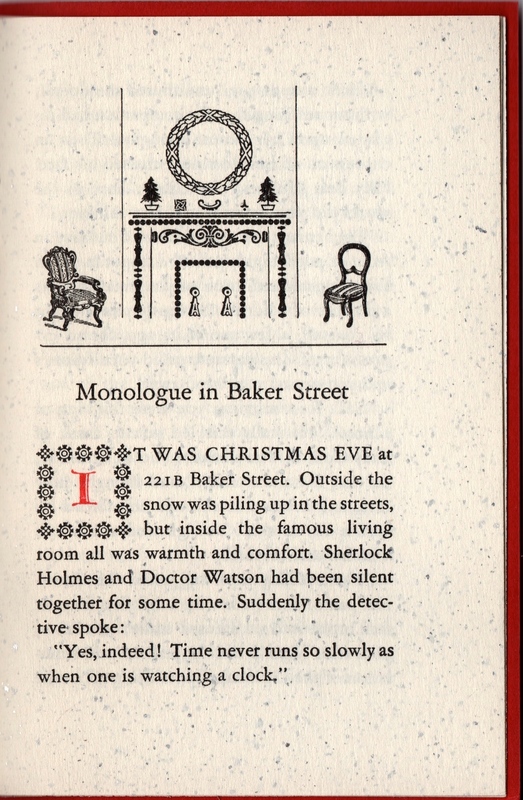 The imagined holiday dialogue between Holmes and Watson has a long publication history. First printed on 3 December, 1950 in The Chicago Tribune (where Starrett was a columnist), it was awkwardly titled "Dr. Watson's Mind Read by Master." It's next appearance came six years later in the 1956 Christmas Annual of The Baker Street Journal. The title became the far less awkward "Monologue in Baker Street" and it has been known by that name since. As you can see from the accompanying illustrations, the little holiday booklet was produced in a limited run of 150 copies. The booklet is a handsome example of small press printing and a tribute to the friendship that existed between The Last Bookman and The Bookplate Artist. I had planned for this article to end here, but there is so much more to say about Starrett, Johnson, their relationship and this image that I have broken the article in two. Next week will have the second half of the story, including the mystery of Harriet and why she had to be gotten rid of.